The main taxes affecting foreign companies established in Madrid are the corporate tax, the VAT and the economic activity tax. Expatriate workers living in Madrid are subject to personal income tax (IRPF), with a very attractive special scheme (régimen de impatriados). Spain also protects both citizens and companies with many double taxation treaties. Today there are 94 active agreements with countries including the primary economic powers worldwide. The corporate tax applies to all for-profit companies in Spain. The general tax rate is 25% for both large companies and SMEs, however rates of 30%, 20%, 15%, 10% and even 1% exist depending on the kind of company. Economic activities tax applies to companies and professionals with an annual turnover of more than € 1 million. The rate depends on different factors such as turnover, sector and property location. The economic activities tax is managed by the Spanish Tax Agency (Agencia Tributaria) and the Madrid city council which provides all relevant information on its website. The personal income tax is applied to the income earned by all citizens living in Spain for more than 183 days a year. It is a progressive tax rate which varies from 19% (up to € 12,450 income) to 45% (more than € 60,000). 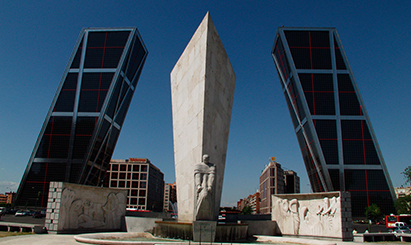 The regions manage part of the tax by defining their own rates and Madrid has the lowest regional rate in Spain. The IVA (value added tax) is an indirect tax on all consumption. There are three levels: the general rate of 21%; a reduced rate of 10% and the basic rate of 4% which applies to staple foods, etc. This cost is absorbed by consumers, however companies must declare the IVA they pay and collect with their activities. Non-Spanish citizens and companies earning income within the country must pay the non-resident tax. The general rate is 25% for companies with a permanent establishment in Spain. For companies resident outside of the country, there are different rates depending on the kind of income and the place of residence (EU or non-EU), with a general rate of 19.5%.